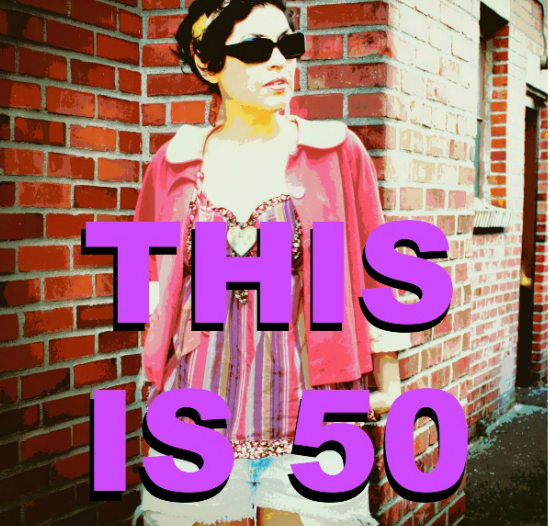 THIS IS 50. Here's some time tested proof that life is not over at fifty. The fifties come in a variety of colors, shapes and sizes. Find the one that's right for you. This is the fourth in the series presenting the incredible range of style-loving women over forty, and we'll now be exploring the dynamic decade of style in your fifties. I am Fay Hallam. I’m 51 and I live in London. I'm happily married. I work as a Theatrical Agent; I represent actors, get them auditions, find them work and negotiate their contracts. I've been doing this for over 20 years. 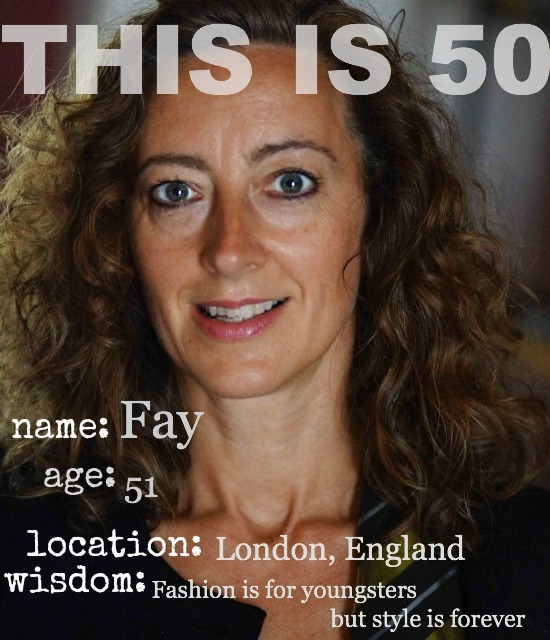 THIS IS 50: Talent agent Fay shows that cool London style still sizzles well into your fifties. How do you feel as a +50 woman and does your style reflect it? I feel great. I’ve taken care of myself and feel that I’ve aged well. My style has evolved through the years and I have adapted it to suit my advancing years but I don’t follow the received “rules” about what older women should or shouldn’t wear. If I like it and it suits me than it stays in my wardrobe. We'd love to hear any honest reflections of body image and what you've done to stay positive about aging. Do you plan to "age gracefully" or "age disgracefully"? I can honestly say that I am happier with my body now than I was when I was younger. I am still a size 8 (UK) and I do Pilates to stay strong and toned. I'm short (5’3”) and always wanted longer legs, less body hair but I have accepted what I cannot change, and I've made the most of what I do have: great hair, long eyelashes and the good genes that have kept me slim. Obviously, we are all susceptible to gravity and things are generally not as firm as they used to be, but I don’t stress about that – it’s natural. Of course, I like it if people compliment on my look but I don’t really care what anyone else thinks as long as I am happy with it. The thought of plastic surgery or cosmetic procedures makes me feel physically sick and I can’t conceive of having anything like that done to me. I think everyone is made up of a complicated mass of different things and distilling it down to 3 words is quite limiting, but if I have to then it would be Curious, Conscientious and Loyal. "As I've got older, I have embraced colour and print, and I am definitely more experimental." For as long as I can remember, I have been obsessed with clothes and jewellery. My personal style is very eclectic and I always say that Style is what concerns me rather than Fashion. I joke that my hobby is collecting clothes and I have amassed an enormous wardrobe over the years but have rarely paid full price for anything. I buy a lot of stuff in the sales or on Ebay. I also enjoy thrift shopping, and more recently, clothes swapping. I hardly ever throw anything away as most trends come back round on a regular basis. I have a self-imposed “uniform” that I wear to work. No-one tells me what to wear but I find that this makes it easier to get dressed in the mornings and it’s important to me that I wear different clothes when I am off-duty. I don’t have a signature look, I like to have a wide variety of things that reflect my moods. Any brief memories on a younger self discovering her style? When I was younger, I wore a lot of black – mostly because it meant that everything matched and I didn’t have to do the laundry as often!! As I've got older, I have embraced colour and print, and I am definitely more experimental. Through the years I have learned what suits me, and now I never wear anything just because it is on trend if it doesn’t do me justice. We all look back at clothes we wore in the past and say “what was I thinking? !” but those things were of their time and are an interesting part of our style history. What advice would the +50 you give to your 20 year old self? Don’t blindly follow the advice in fashion magazines or copy what your friends are wearing. Try out as many styles as take your fancy – you don’t have to be limited by adopting just one look. It's ok to make mistakes and take chances along the way, because eventually you'll choose clothes that flatter your shape and personality. Fashion is for youngsters but style is forever. Time flies so enjoy being young but don’t think that life gets less interesting when you reach 40! I've been reading these posts, but haven't commented until now because I think worrying about age while you're still in your 40s is kind of premature. The 40s seems relatively young to me now! But the 50s is certainly not old either - there's still work to do, things to see, people to meet, laughter to be had. Age is just a mile post, not a character trait. Great interview with Fay, who proves that 50 doesn't mean fuddy duddy, and I love that black crinkly dress in the second photo. Fay probably knows my husband's ex-girlfriend, who is also an theatrical agent in London. 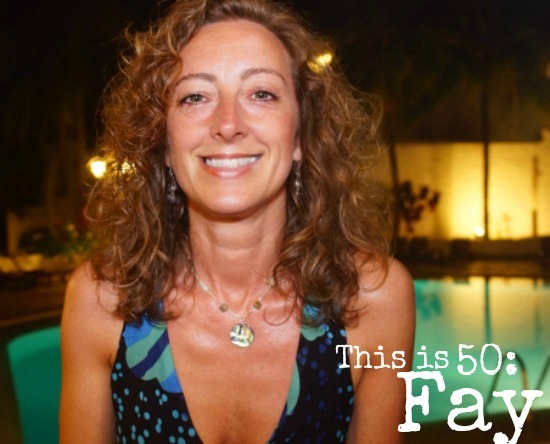 I loved reading through this interview you did with Fay! It made me feel a lot better about 30. I've been not dealing with the thought of that so well. Thanks for the inspiration ladies! 50 is not too far away for me, so this made interesting reading. I know I spend too much time in jeans and looking at fab Fay makes me realise it's time to get out of the comfort zone once in a while! I'm not quite there yet .. but it's good to know that 50 kicks a$$ !! Fay's my Facebook friend, she's fab. She is gorgeous and has fabulous skin!! Thanks for the feature, Bella! oh my! what a dress! Very cool interview. Thanks for introducing me to Fay. Truly fabulous over 50. What an incredible dress on Fay! Great feature on her as well, looking fabulous! Happy October! Lovely!! Thanks for sharing that!